I loathe spending a minimum of $0.50 per packet for seasonings, so I’ve made it my mission to recreate those packets at home for less! 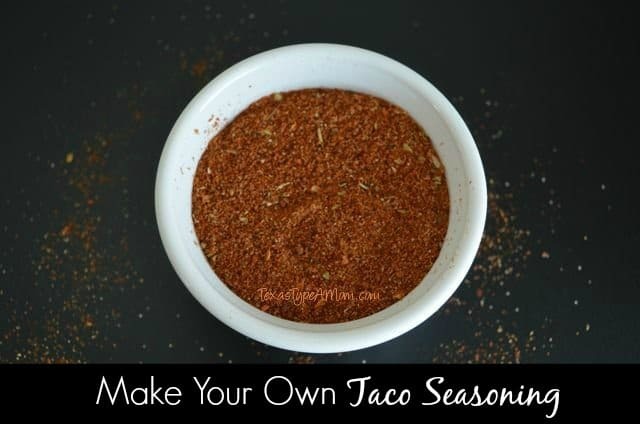 This taco seasoning recipe is pretty tame but you can add additional chili powder or red pepper flakes to make it spicier! This recipe only yields one ounce so my suggestion would be to make it as is the first time around, but if you like it after that make it in larger batches to fill your desired container. Mix together all ingredients and store in an airtight container or jar. In the mood for Mexican food? Check out my Southwestern Chicken recipe or easy cheesy Chicken Enchiladas! Looking for even more ways to save money? Check out these 5 Ridiculous but Effective Ways to Save on your Groceries! Very doable! I just always run out of the stuff. It never occurred to me to make it. Thanks for the recipe. That is a great idea, and I like it spicy so I'd definitely be adding some cayenne. I make my own taco seasoning too! 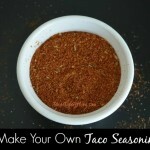 We love making our own taco seasoning, plus it's healthier! Looks like it will be really good you could jar and sell it…"TEXAS TYPE A MOM'S TACO SEASONING" Made with Texas pride! THANK YOU! I've been looking for a recipe for Taco Seasoning. I want to make my own so I can control the salt content….the pre-packaged ones are way too salty! You are a genius! I love this idea. Seriously, how much cheaper and easier is it to just keep a jar of this on hand? I just made tacos today! I make my own seasoning too.